I’ve been on a break at home, having a rest and trying to get stuff done around the house. Alas, this is now at an end, and while I guess I’ve had a rest, I certainly haven’t got all the stuff I planned done. And people telling me “nobody ever does” isn’t helping. My break was timed to miss most of the big south-east rail shutdown. Moorabbin (Frankston line) and Westall (Dandenong line) to the City have been replaced by buses between 2nd and 13th of January. The Sandringham line was also bustituted between Elsternwick and the City between 2nd and 5th of January. 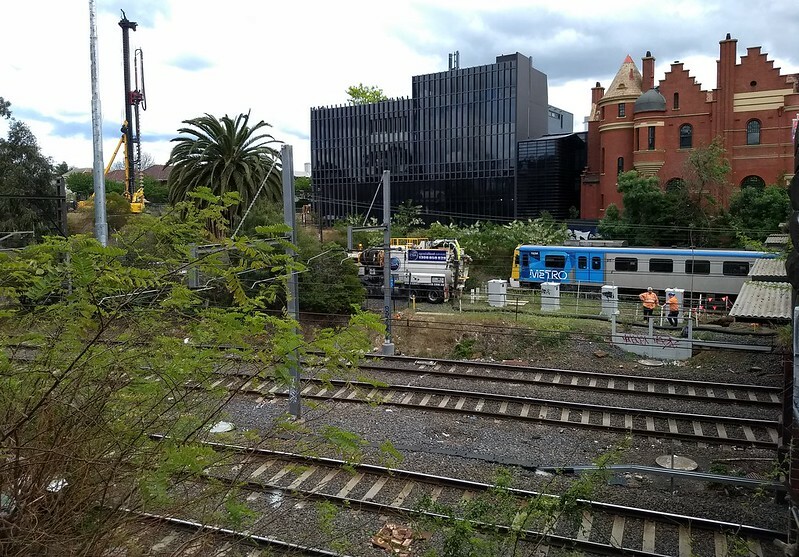 This is all due to works for the metro tunnel near South Yarra station, in preparation for building the tunnel portal there. 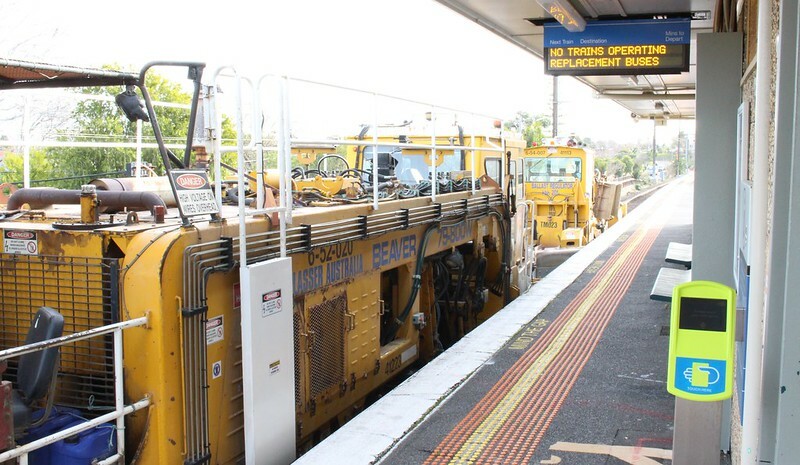 There are also works preparing the Dandenong line for the High Capacity Metro Trains. …and a few days ago – the hill and all the trees are gone! Also observed: at South Yarra the extensions to platforms 5 and 6 are nearing completion. Upgrades and new infrastructure are important, and if you’re going to close rail lines, early January is the time to do it. The question is: how good is the information provided to people, and how smooth are the replacement buses? I would say: not too bad. Buses always struggle replacing trains, but I think they’re getting better at this. Some people will always miss the notices, and just rock up to the station. So prominent signage on approach and at station entrances is helpful. Some of the notices need review. I have my doubts about the detailed bus timetables posted at stations – their usefulness and their scope for incorrect interpretation. The signage pointing the way to the temporary stops seems pretty good. Big and bold. Signs at replacement bus stops could improve. They generally don’t have any detail, such as bus stopping patterns, or days of operation. There were sightings of people waiting at the stops a day early – the signage was up, but the trains were still running. Likewise, last year some of the signage came down a few hours early, leading to confusion on the final night. Location of the stops seems okay – from what I’ve seen, it’s consistent with past occupations, mostly along main roads to ensure a relatively quick ride. An exception is citybound at McKinnon, where they can’t make up their mind if it’s outside the pub again (where staff tend to be located, and there’s a temporary shelter), or 50 metres up the road (where the bus stop sign has been installed). Supply and despatch of buses seems to have mostly been good, though there have been some long queues in the City in PM peak. They may of slightly underestimated how many came back to work today. Less confusion around Myki touch-on (the buses are free). But there seems to be no consistency around whether all-door boarding is used or not. Information needs to be consistent. Signage tends to say “to City”, which is very clear. But many announcements I’ve heard at stops have said “to Flinders”. This is less clear. On one bus I was on, when it was announced that “this bus is express to Flinders”, 80% of the passengers got off the bus, then most of them got back on. I think “City” would be better. Also: “to Flinders“? I know that’s how some refer to it, and I know I’m being a pedant, but it’s really “Flinders Street”. Flinders is a completely different place. The replacement bus routes have split different passenger groups to different services, and seem to have worked well. Lighter than usual traffic at this time of year certainly helps. Travel time from my limited samples: Bentleigh to City (Arts Centre) is around 40-46 minutes, depending on time of day. 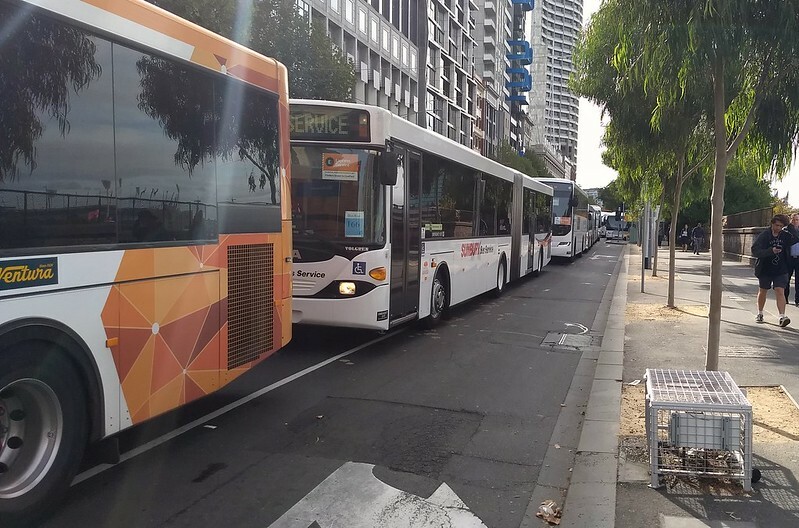 Routes varied – some buses take Dandenong Road/St Kilda Road, others take Burke Road and Citylink. I haven’t sampled other routes – how’s it been? They still haven’t fixed the Patterson bus zone, which remains 7am-7pm Monday to Saturday, despite rail buses running until around 1am (and all night on weekends), and even regular buses serving the stop every day until around 10pm. Should I just go park my car there every Sunday until they fix it? 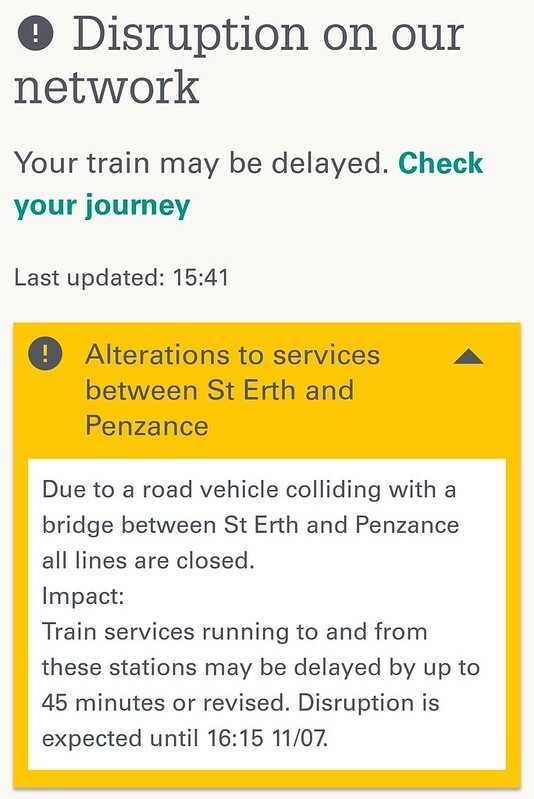 The rail shut down has meant there has been extra pressure on nearby routes: trams and buses that run towards the City or connect with other rail lines that are still running. 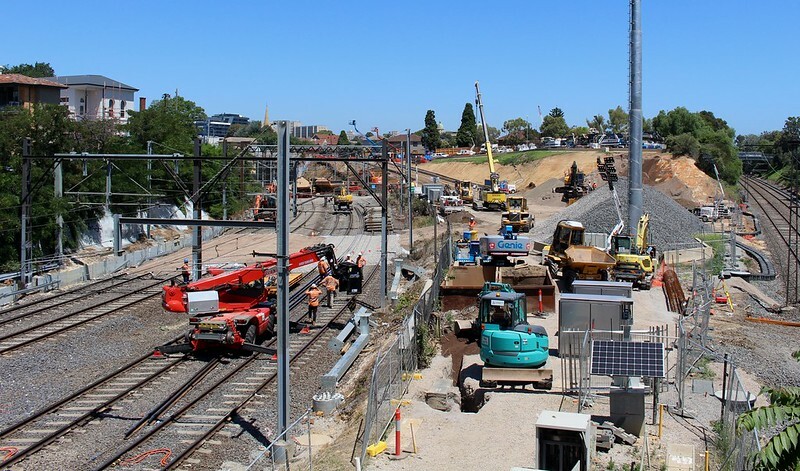 Little or no effort seems to have been put into additional services – apart from the Sandringham line, which is part of the Frankston replacement route for some passengers this week. There have been some BIG issues with the PTV timetable data recently. 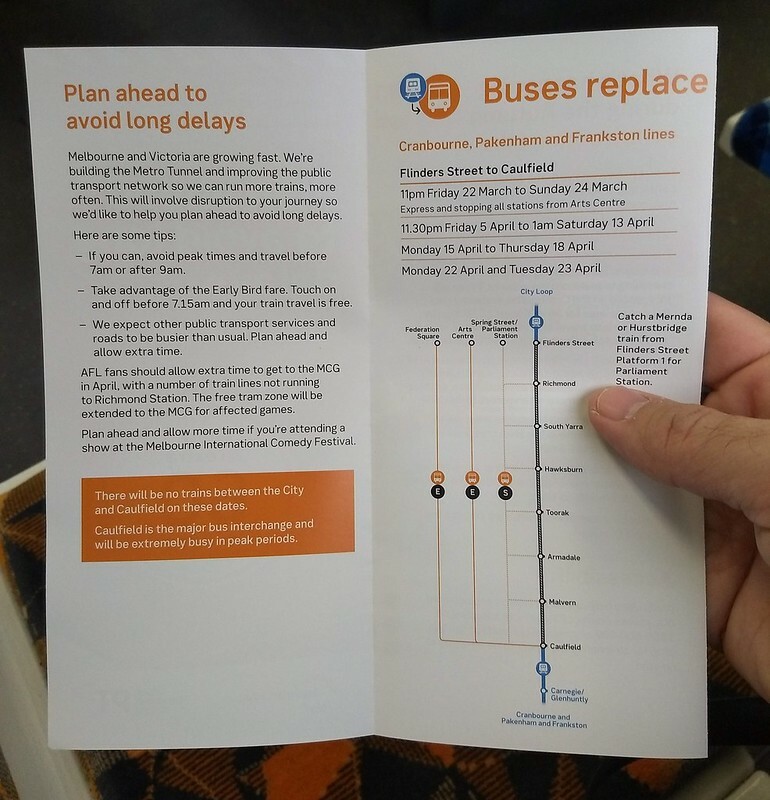 South Gippsland coach routes still have non-existent (during works) Metro train connections from Dandenong to the City, which gives incorrect results in the Journey Planner for some trips. And lots of other data is showing up with errors, such as Peninsula bus route 788 missing most of its trips. What else have people (who have perhaps been commuting more than I have!) seen during the shutdown? 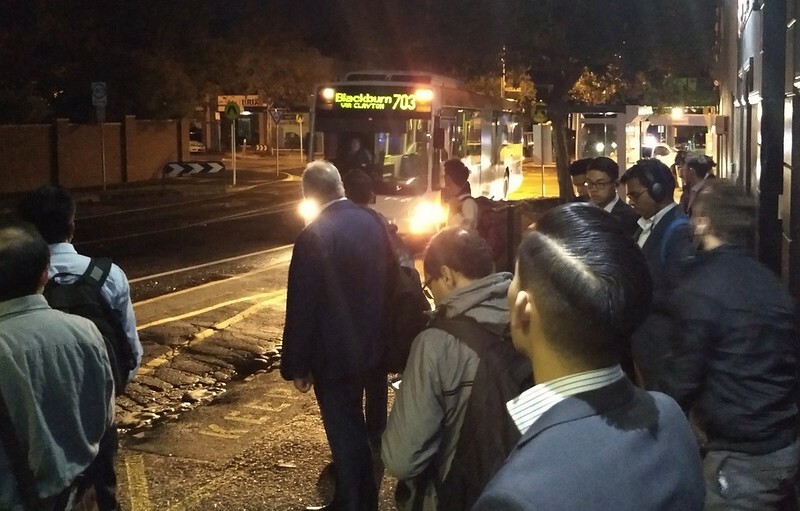 For the past five days — from 8:30pm last Thursday, to last night (Tuesday) — the Belgrave, Lilydale, Alamein and Glen Waverley lines were replaced by buses between the city and Camberwell/Darling. Thankfully it’s over now. But it was a huge disruption, affecting passengers on a full quarter of the network. PTV station boarding figures from 2014 indicate the affected stations have 113,700 boardings per weekday. Assuming most of those passengers travel into the area where trains weren’t running, and most make a return trip, we’re probably talking about more than 200,000 trips per weekday impacted. 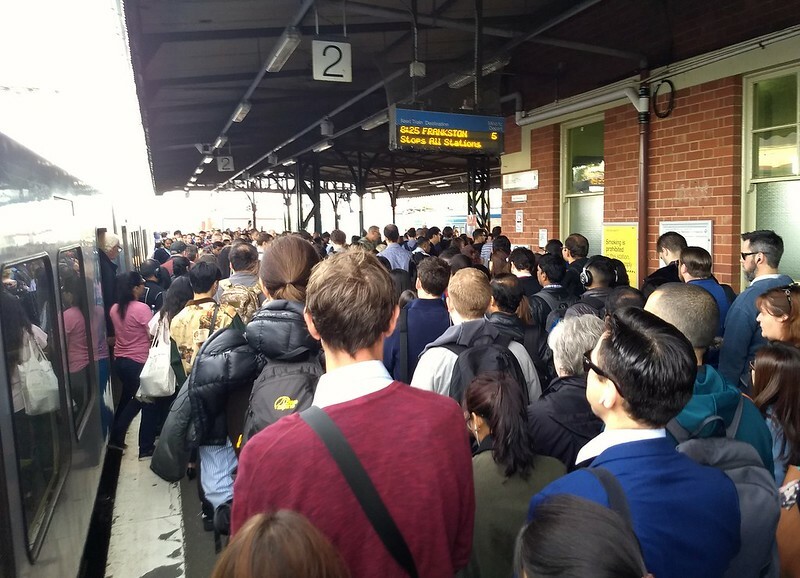 For those who braved the train replacement buses, there have been long delays, both at interchange hubs such as Camberwell, and on the buses themselves, which have been caught in traffic. On Friday there was the additional challenge of the weather. Rail upgrade works are important; everyone knows they need to happen. 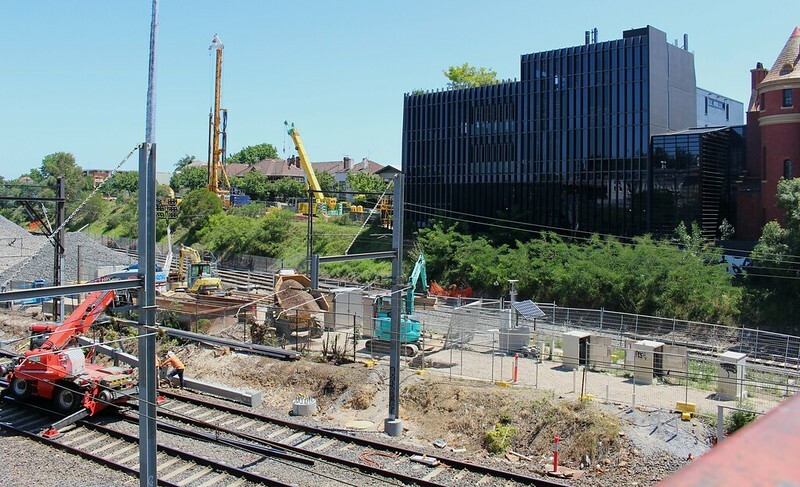 And there are lots on at the moment, with level crossing removals, and plenty of other projects bubbling along. Why such a big shutdown in December? Why not January, when there are fewer people travelling? It’s because… there’s something even bigger coming in January. Nothing’s been officially announced yet, but I’ve been told several times (and it wasn’t flagged as confidential) that major works will shut down the entire Caulfield group in early January. My understanding is that from the 2nd to the 7th 9th of January, all Cranbourne, Pakenham and Frankston trains will terminate at Moorabbin and Westall Caulfield (or possibly even Oakleigh, according to my scribbled notes), and my assumption is that Sandringham trains will terminate at Elsternwick. Update 7/12/2017: Corrected the above, as official information has now been published. See the bottom of this post. 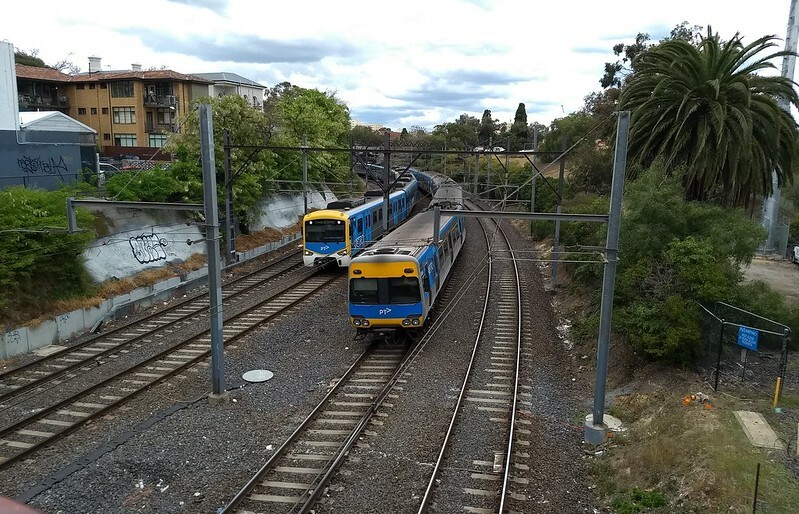 The entire inner-city section of those lines will be replaced by buses — though they may get creative and bus some people over to other lines, just as they’ve done with parts of the Glen Waverley line recently. You’d hope they’d put extra trains on other lines, and co-ordinate with authorities managing roads, trams and buses as well… given the past few days. 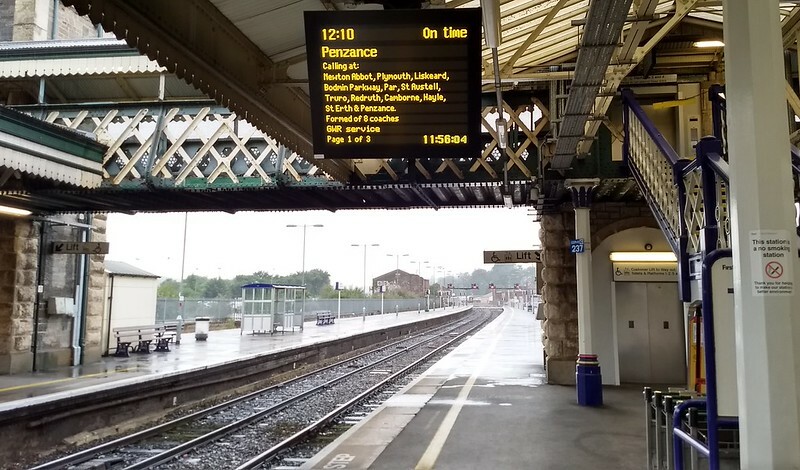 The affected stations on these lines to be closed account for 165,880 122,830 boardings per weekday, about 45% 8% more than the Burnley group of lines. Trust me when I say that as a Frankston passenger, this is not going to be fun. Maybe I should book some annual leave? Why don’t they give us longer notice? Some of these projects are years in planning. It beats me why authorities don’t flag them further in advance more than a couple of weeks. Even now, as people continue to ask why the Burnley group works didn’t wait until January, they don’t have an answer to share. If people had more notice, some of them might be able to plan leave from work, to make things easier for themselves. Workplaces might be able to adjust shift times, or organise car pooling or working from home. At the very least people might be able to understand the context of the overall works plan, and why some projects are scheduled at particular times. It’s perfectly possible to give 2-3 months notice… because it’s been done before. Back in 2012, then-public transport minister Terry Mulder made the decision to flag major works up to 3 months in advance. As you can see thanks to the Web Archive, this Department of Transport page from March 2012 listed major works up to the end of May. This didn’t last long. 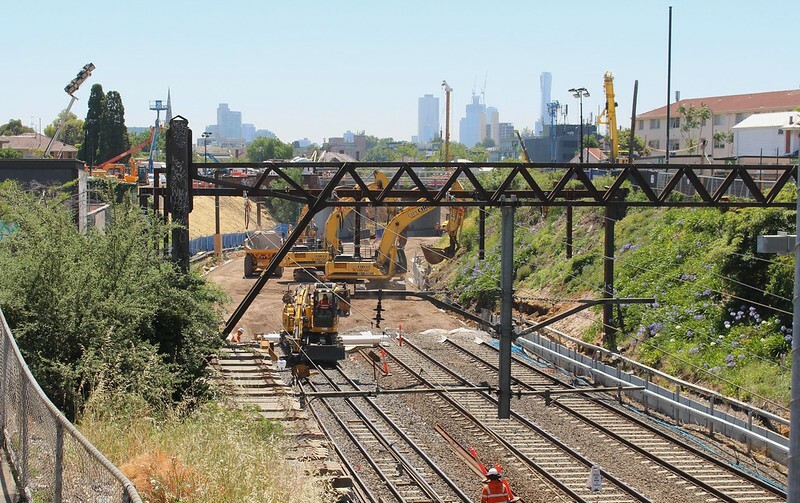 As I recall, within six months, they were back to flagging works only a couple of weeks in advance, though Yarra Trams has a list that includes some advance changes, and sometimes the Level Crossing Removal Authority gives longer notice of major shutdowns. Publicising major works well in advance wouldn’t help everybody, but it would help some. And the more people who can plan their holidays or travel around those disruptions, the better for everybody. The day after this blog was published, Metro and PTV largely confirmed the January closure, though the details have changed a bit along the way. 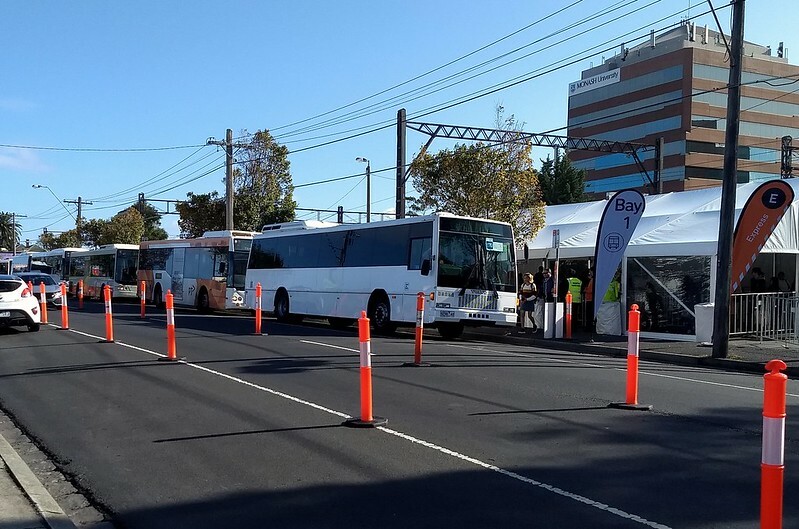 It appears the Sandringham line will not be affected, however there will be express buses from Moorabbin to Brighton Beach, meaning many Frankston line passengers will be added to that line. 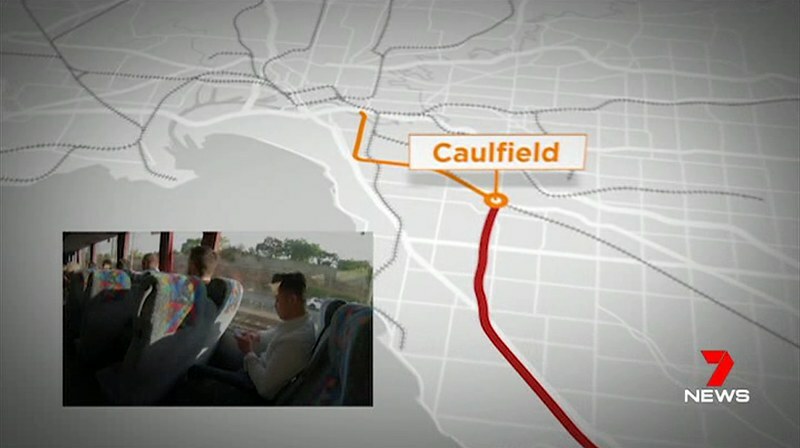 There are also buses from Westall to East Malvern on the Glen Waverley line. Hopefully both lines both get additional services. We bade our farewells to the family and my uncle K gave us a lift to Taunton station. First step to our next destination was a train to Exeter, or to be precise, Exeter St Davids. As with Bath a few days earlier, Exeter is served by multiple railway stations, originally built by different railway companies. 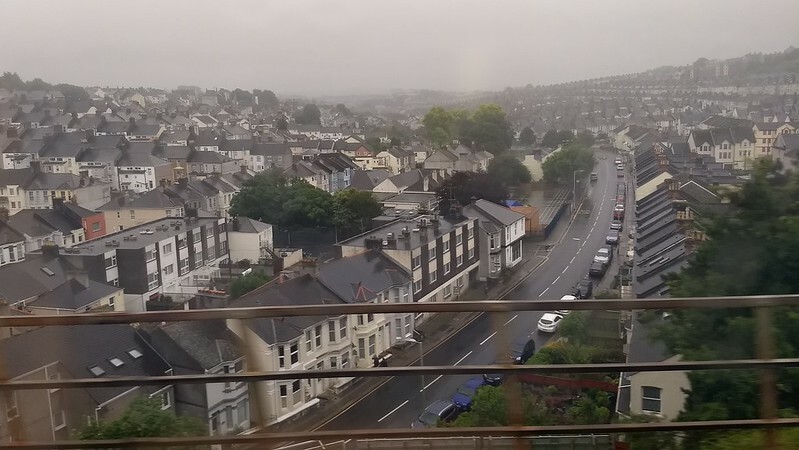 We had to change trains at Exeter, but first we peered outside (pouring with rain, pretty much the first rain we’d encountered on the trip) and bought some sandwiches to eat on the way. Our next train was heading for our destination: Penzance. It was the grandly named Cornish Riviera Express. Apparently this name has been used since 1904. It was mentioned on the station displays, though I didn’t notice any specific branding on the train itself, which was a standard High Speed Train (Intercity 125) set. 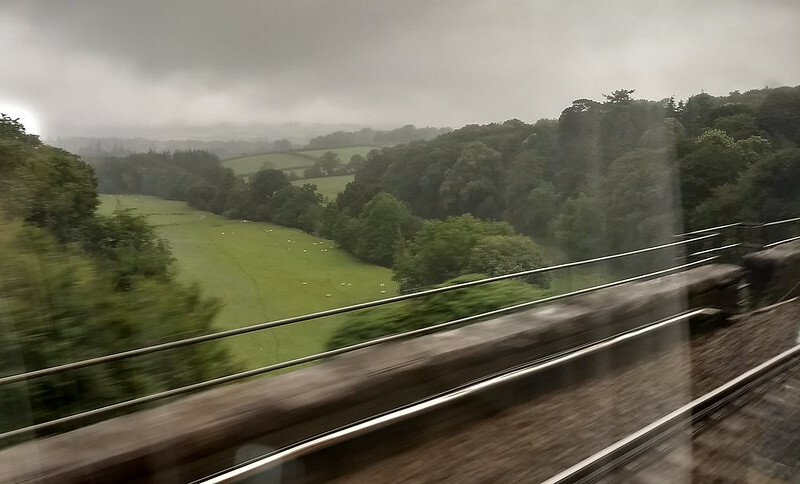 We zoomed along through Devon, with some great scenery despite the grey skies. Yet another grand bridge built by Brunel carried us across the River Tamar and into Cornwall. In fact we passed over numerous bridges, with some very impressive views along the way. Of course you can’t really see the bridges when you’re in the train, though in this case we got a good view of the parallel road bridge. 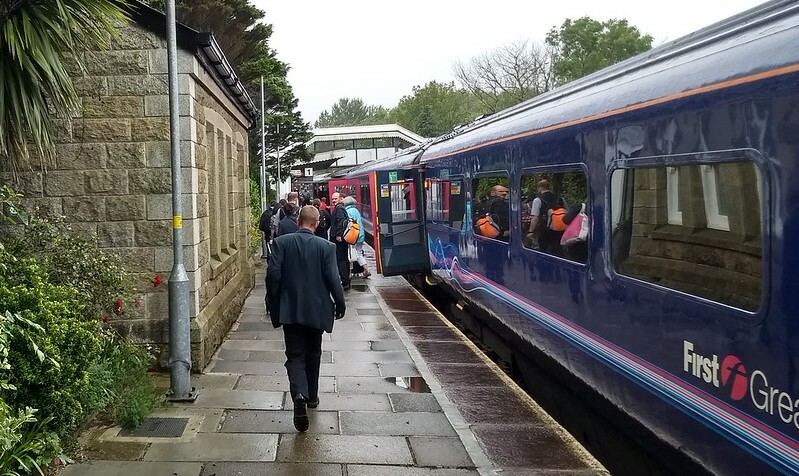 And then… we stopped at St Erth, one station short of Penzance, about 10 kilometres away. For a while we didn’t move. My spidey sense detected something wrong. Then the announcement. A truck (sorry, a lorry) had struck a bridge up ahead. The conductor, sorry train manager (fair enough, these HST trains are pretty long, and they actually have quite a few staff) got on the PA and apologised profusely, but we’d need to hop off the train here and wait for replacement buses. We all got off the train in the drizzle and sheltered in the undercover part of the platform. The train manager and her colleagues were on their two-way radios trying to find out about replacement buses and/or whether the train would continue on once engineers had checked the safety of the bridge. After a few minutes they said that due to the delay, the train would be short-shunting and heading back to London. One of the rail staff suggested, given there was no ETA on trains resuming, that people exit the station and try their luck with the local buses. 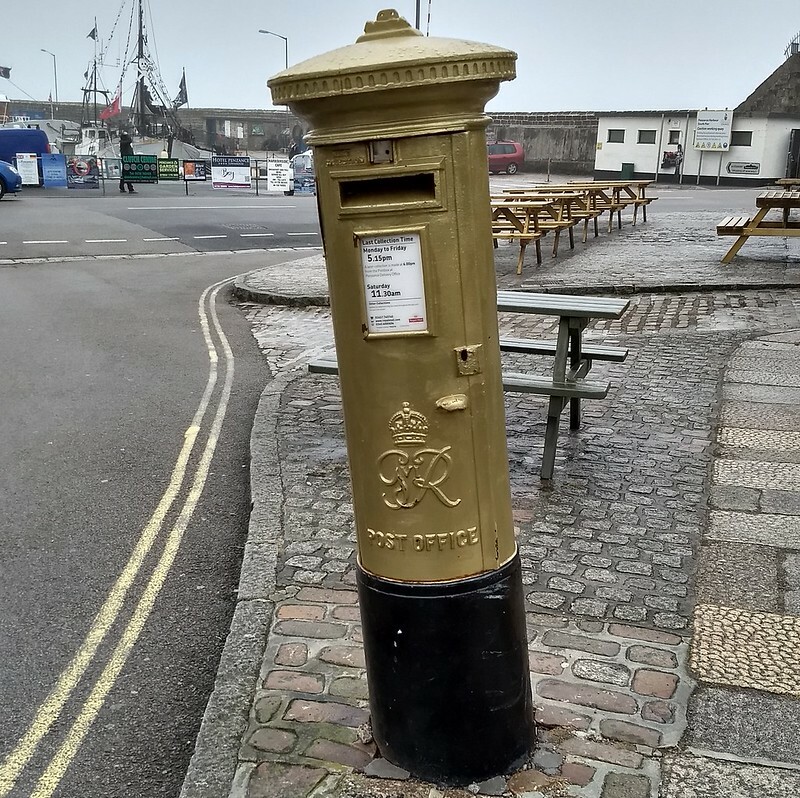 I checked Google Maps for buses – they ran about every 20 minutes from here to Penzance. I also checked the Uber app. Nothing nearby. 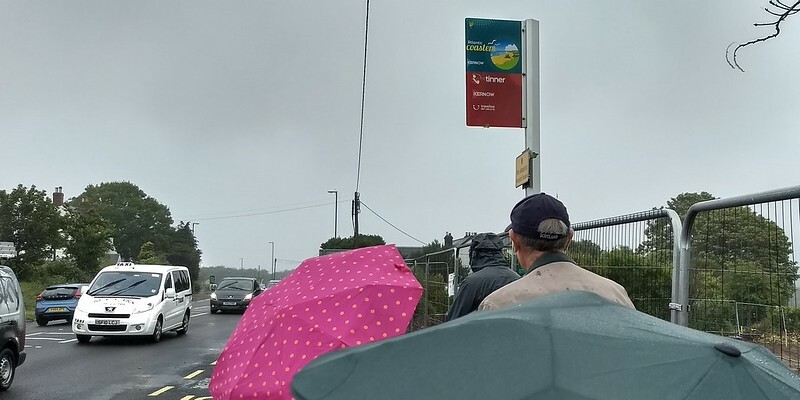 So in light drizzle, we joined a queue of the braver passengers at the bus stop on the main road. A bus arrived and a rail staffer hopped on first to check with the driver about them accepting rail tickets. 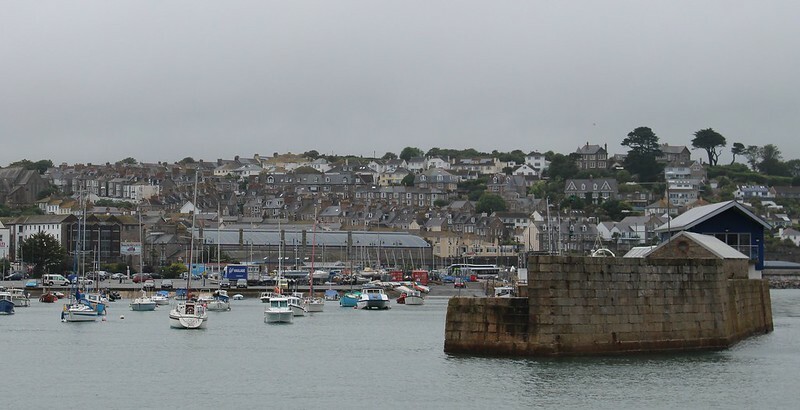 The bus driver, who in fact is from the same parent company, seemed more concerned with just keeping to his schedule, and let everybody aboard gratis, so we squeezed on with our luggage and had a slightly more lurchy, cramped arrival in Penzance than expected. We’d come halfway around the world and we’d been short-shunted and bustituted. Update: On 14th September, GWR emailed me to say they’d be refunding us £60, by cheque. Will be interested to see if a cheque shows up in the mail. From the bus station, we walked to hotel, just off the main drag, which curiously is called Market Jew Street. Apparently the name is a derivation of the Cornish Marghas Yow meaning Thursday Market. The bloke on the hotel front desk asked “Where from Oz are you?” Melbourne – “Ah! I had a working holiday there, lived in Hawthorn for a while.” Small world. Nearby was a house marked with a non-blue plaque noting that the aunt and mother of the Brontë sisters had once lived there. History. We headed down towards the sea to explore. It wasn’t cold and it wasn’t raining, but the weather was more than a bit breezy. 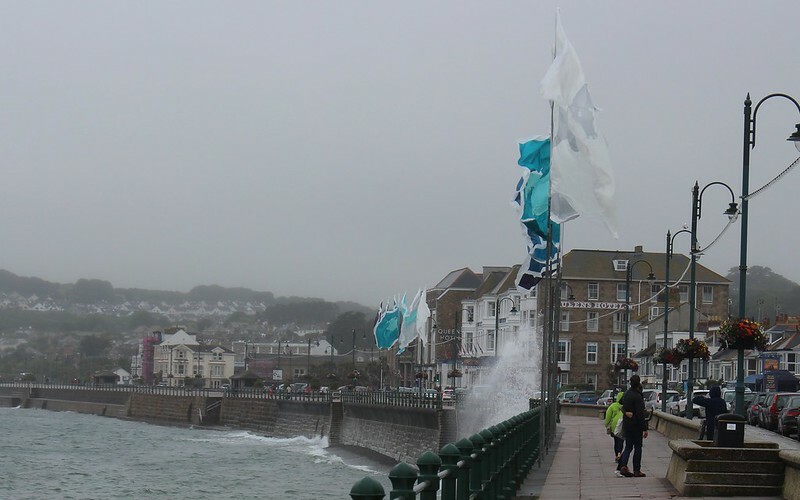 Powerful waves were hitting the coastline. I was keen to look closely, but keener still to keep my feet dry, as in an attempt to pack light, I’d only brought one pair of shoes on the trip. As you may be able to hear from my exclamation, this was not entirely successful. No pirates were obvious, but they wouldn’t be, would they? Trivia from Wikipedia on The Pirates Of Penzance: The work’s title is a multi-layered joke. 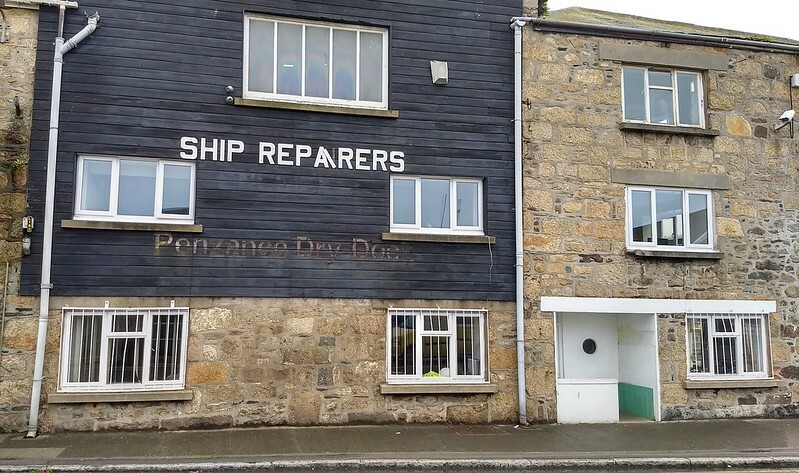 On the one hand, Penzance was a docile seaside resort in 1879, and not the place where one would expect to encounter pirates. On the other hand, the title was also a jab at the theatrical “pirates” who had staged unlicensed productions of H.M.S. Pinafore in America. Apparently the lack of international copyright had caused problems for Pinafore. 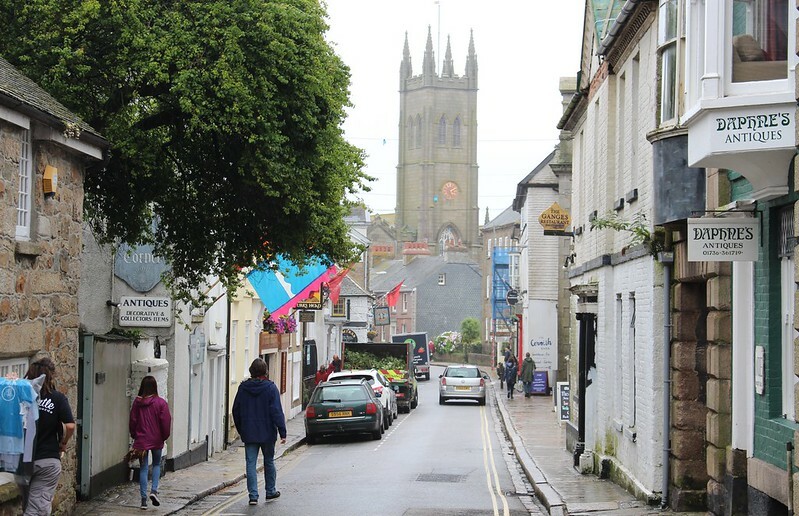 Nowadays the locals seem enamoured of Poldark, which is filmed and set around Cornwall. 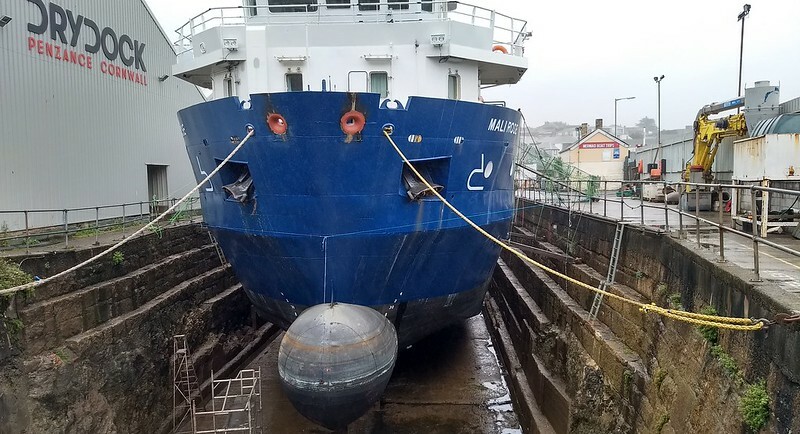 Other sights included a drydock, ship in situ, and various other shippy infrastructure which indicated it’s very much a working harbour. 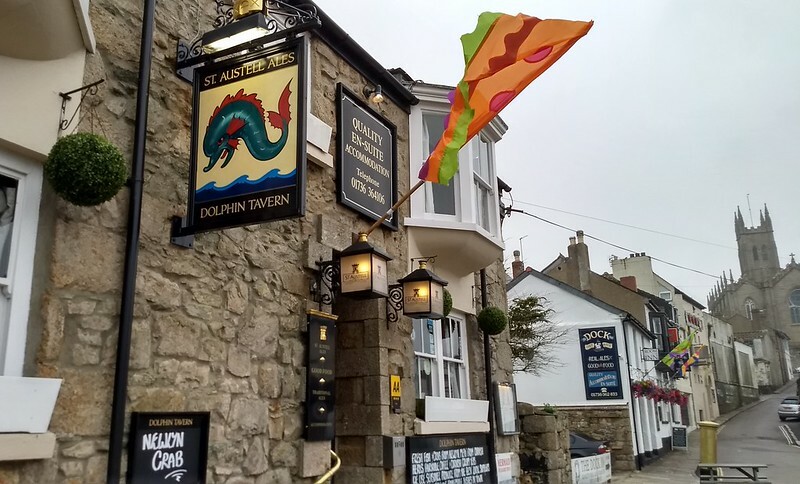 After a long walk around, we ended up back in the middle of town, and decided to eat dinner at a pub we’d spotted – The Dolphin, by the water. Most delicious. Then some more walking around before we headed back to the hotel. 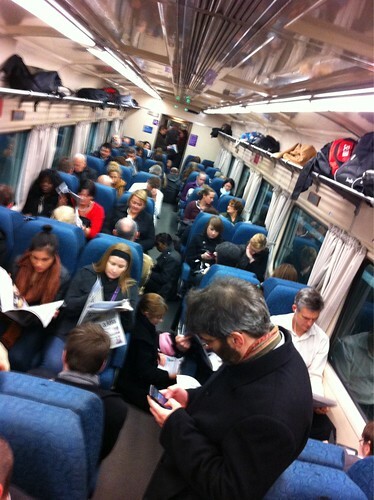 How many catch V/Line in peak hour? Last night on the TV news they seemed to be struggling for an accurate figure of how many were affected by the closure of the Geelong line. One said “hundreds”, another said “up to a thousand”. 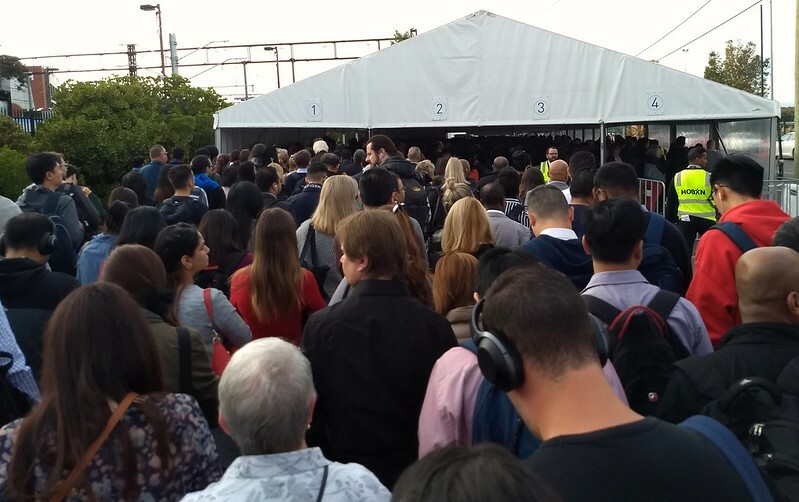 Figures on V/Line’s web site, which summarise the number of people on each train so you can plan your trip to avoid the packed ones, indicate that about three thousand catch the Geelong line each peak hour. The figures appear to show 100% when the services are over-capacity — eg when people end up standing or sitting in aisles on the trip. I knew they’d grown strongly since the Regional Fast Rail upgrades were completed mid last decade, and the 2007 price cut, but I’m almost surprised to see the Bendigo and Ballarat lines up within about 10-15% of the Geelong figures. 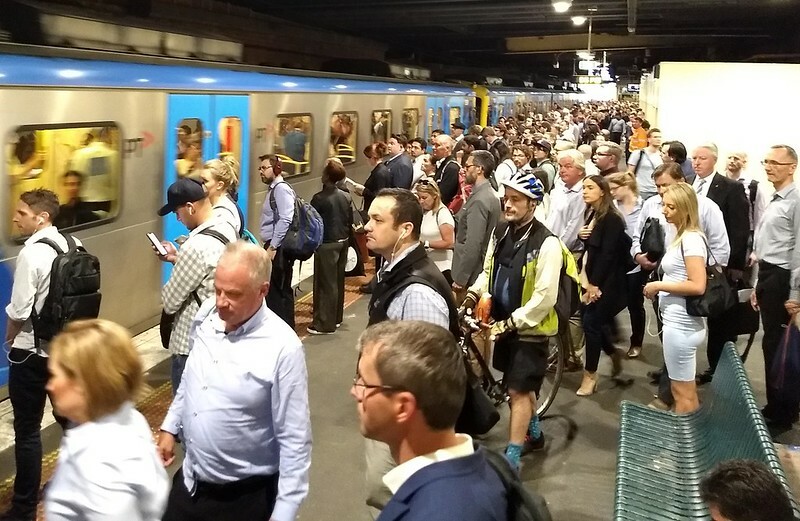 This probably emphasises why V/Line and the Department of Transport have been so keen on the Regional Rail Link project, to get all the busiest lines on their own tracks within the suburban area. 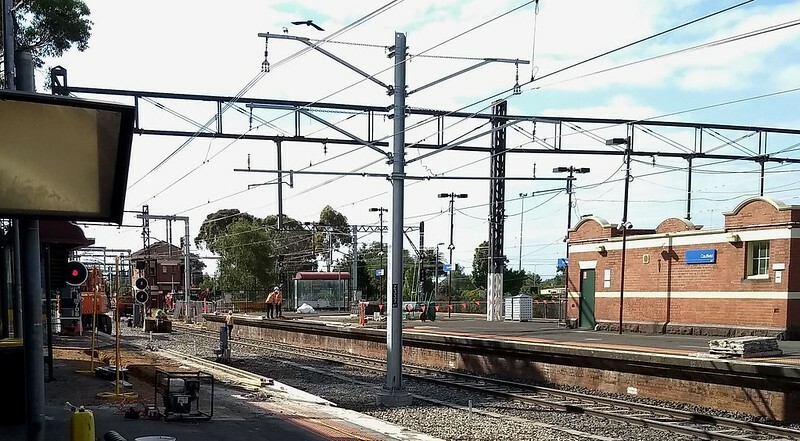 The Bendigo figures are likely to drop when Sunbury and Diggers Rest stations join the electrified Metro network later this year. This will also free up some carriages to run on other lines. Obviously off-peak passengers are also affected by line closures, and we don’t have figures for them. To a greater extent than Melbourne suburban services, V/Line services are very concentrated in the peak (trains every few minutes in some cases), but quieter outside it (mostly hourly). Something they could/should do to help spread the peak load is upgrade off-peak frequencies. Related: How many people use each (suburban) station? PS: I see some real figures have made it into an Age Online story this morning.